Members of the LOTT Research Group and their affiliations are listed in the Acknowledgements section of this article. Background: Chronic obstructive pulmonary disease (COPD) patients enrolled into the Long-term Oxygen Treatment Trial had hypoxemia at rest, hypoxemia on exertion, or hypoxemia both at rest and on exertion. We hypothesized that patients with different patterns of hypoxemia may have significant differences in clinical features. Methods: All patients had COPD and oxygen saturation measured by pulse oximetry (blood oxygenation [SpO2]) at rest and during the 6-minute walk test (6MWT). Hypoxemia at rest was defined as resting SpO2 between 89-93%. SpO2 < 90% for at least 10 seconds and ³ 80% for at least 5 minutes during ambulation characterized hypoxemia on exertion. Severe exercise hypoxemia (< 80% for > 1 minute) was exclusionary. Results: Of 738 patients studied, 133 (18.0%) had mild-moderate hypoxemia at rest only, 319 (43.2%) had hypoxemia on exertion only, and 286 (38.8%) had hypoxemia at both rest and exertion. Patients with hypoxemia at rest only were more likely to be current smokers, had higher body mass index (BMI) and a higher incidence of self-reported diabetes. Patients with hypoxemia on exertion only were more severely obstructed compared to the other groups. General and disease-specific quality of life scores were similarly impaired in all groups. Quality of well-being scores were more impaired in those with hypoxemia at rest only. Conclusions: COPD patients with mild-moderate hypoxemia have distinct clinical characteristics based on the pattern of oxygen desaturation at rest and with exertion. Funding Support: This project is supported through federal funding from the National Heart, Lung, and Blood Institute, the National Institutes of Health, the Department of Health and Human Services [contracts HHSN268200736183C, HHSN268200736184C, HHSN268200736185C, HHSN268200736186C, HHSN268200736187C, HHSN268200736188C, HHSN268200736189C, HHSN268200736190C, HHSN268200736191C, HHSN268200736192C, HHSN268200736193C, HHSN268200736194C, HSN268200736195C, HHSN268200736196C, HHSN268200736197C, Y1-HR-7019-01, and Y1-HR-8076-01] in cooperation with the Centers for Medicare and Medicaid Services, and the Department of Health and Human Service. Note: Some of the data in this article was presented in an abstract at the American Thoracic Society International Conference in San Diego, California on May 19, 2014. These results were followed by the widespread use of LTOT in patients with COPD, even when severe and persistent hypoxemia was not present. These data, combined with expert opinion, contributed to the development of clinical guidelines, but many questions and controversies still exist regarding the use of LTOT.3 In the National Emphysema Treatment Trial, the use of continuous oxygen in patients with resting nonhypoxemic emphysema was associated with increased disease severity and mortality. The increase in mortality was associated with a higher prevalence of exercise desaturation in those using continuous oxygen. It was not clear whether a harmful effect of oxygen therapy contributed to the increased mortality, or whether use of continuous oxygen was a marker of more symptomatic patients who had a greater burden of disease.4 Additionally, the beneficial or harmful effects of using continuous oxygen therapy in this patient group remained unclear. The LOTT cohort presents an opportunity to evaluate the clinical characteristics of patients with COPD who have different patterns of hypoxemia. Many factors may contribute to the differences in hypoxemia at rest or with exertion, such as the severity of airflow obstruction, body habitus, gender, race, smoking status and the presence of comorbidities. We retrospectively examined pre-randomization data of LOTT enrolled individuals to determine if the pattern of hypoxemia was associated with distinct differences in the clinical characteristics of the patients with COPD. These results may be useful in helping clinicians to better understand the oxygenation patterns and associated medical problems of patients with COPD. Patients were recruited to the LOTT if they were 40 years of age or older, had a diagnosis of COPD, and had at least a 10 pack-year history of cigarette smoking. The diagnosis was confirmed by the presence of a post-bronchodilator forced expiratory volume in 1 second (FEV1) less than or equal to 70% of predicted, and a post-bronchodilator FEV1/forced vital capacity (FVC) ratio less than 0.70. Patients who had an FEV1 > 70% of predicted could still be included if there was radiologic evidence of emphysema present on imaging studies. Eligibility required dyspnea as measured by the modified Medical Research Council (mMRC) dyspnea scale (i.e., score of at least 1) and that the dyspnea and lung disease process be dominated by COPD in the judgment of the study physician. Severe exercise hypoxemia defined as SpO2 below 80% for at least 1 minute during the 6MWT was exclusionary. All patients had to be Medicare beneficiaries with both Part A and Part B coverage, be served by the Veteran’s Administration, or have insurance or other resources to cover the costs of the trial that would have been typically covered by Medicare. Patients were approved for entry into either treatment group by the study physician, provided informed consent, and were randomized within 60 days of initiating evaluation for eligibility. The study received approval by the institutional review boards at each of the participating institutions, the LOTT Steering Committee and the National Heart Lung and Blood Institute (IRB Approval #21874). Baseline pre-randomization data were collected for each patient, including room air resting oximetry, room air 6MWT, age, gender, race, spirometry, symptom scores, tobacco and oxygen exposures, the Epworth Sleepiness Score (ESS), and comorbidities. Of the 738 patients studied, 133 (18.0%) had mild-moderate hypoxemia at rest only, 319 (43.2%) had hypoxemia on exertion only, and 286 (38.8%) had hypoxemia at rest and on exertion. Demographics were similar between groups (Table 1). All 3 groups had a mean 6MWT distance greater than 1000 feet. Patients with hypoxemia on exercise only walked further than patients in the other 2 groups but this was not statistically significant. 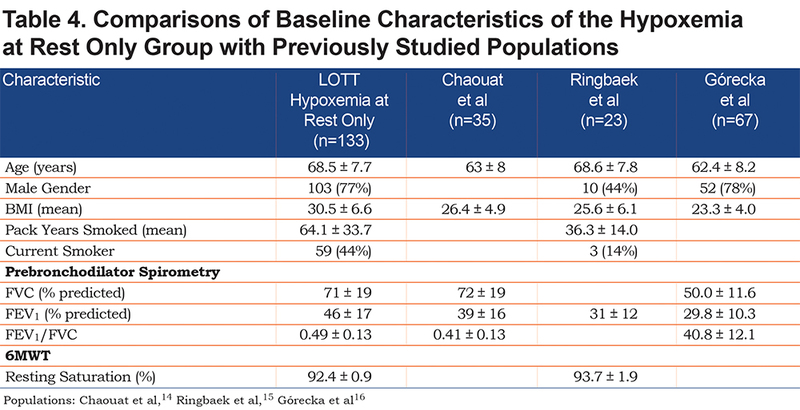 As expected, resting SpO2 was different between the groups; patients in the “hypoxemia at rest and with exertion” and “hypoxemia at rest only” groups had lower mean resting SpO2 (91.8 ± 1.2% and 92.4 ± 0.9%) than patients with hypoxemia on exercise only (95.3 ± 1.3%, p-value < 0.001). Mean body mass index (BMI) was elevated in the “hypoxemia at rest only” group compared to the other 2 groups. Pre-bronchodilator spirometry (Table 1) revealed more severe obstruction in patients with hypoxemia on exercise only compared to the other groups. 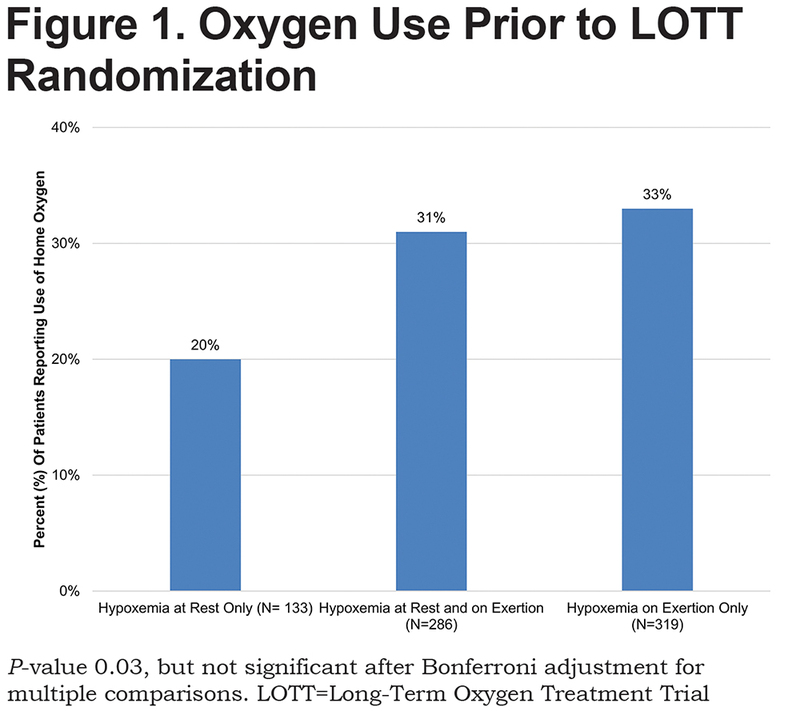 These patients also were more likely to be using oxygen at the start of LOTT (Figure 1), but this relationship was not significant after Bonferroni adjustment for multiple comparisons. However, they were less likely to be current smokers. 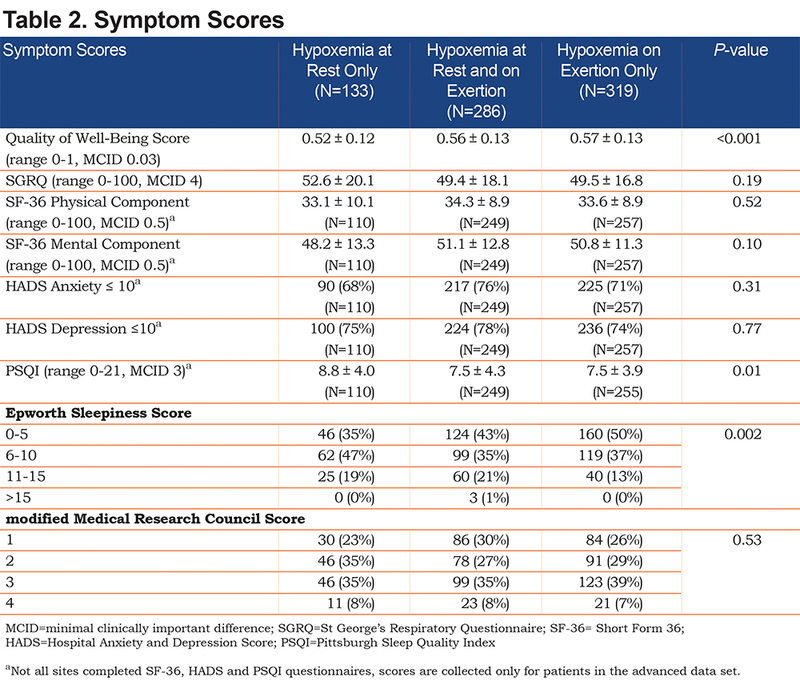 ESS revealed that patients with hypoxemia at rest only were more likely to report symptoms of daytime hypersomnolence (Table 2). Similarly, Pittsburgh Sleep Quality Index (PSQI) scores tended to be more impaired in the patients with hypoxemia at rest only group. Although these variables consistently revealed a trend toward an increased likelihood of sleep-disordered breathing in this group, this relationship was not significant after Bonferroni correction for multiple comparisons. 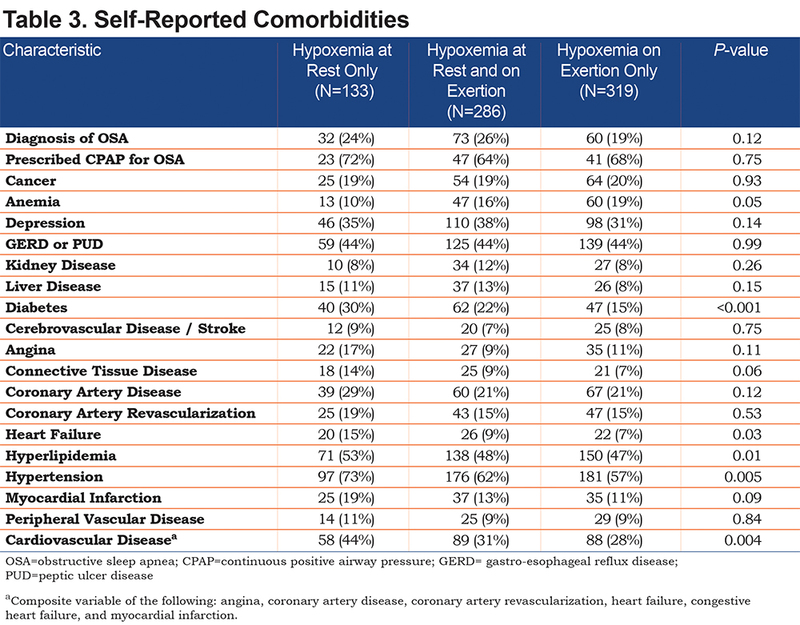 Other differences existed between the groups regarding self-reported comorbid diagnoses (Table 3). Patients with hypoxemia at rest only were more likely to suffer from hypertension, hyperlipidemia, diabetes, heart failure, and cardiovascular disease based on a composite variable including myocardial infarction, coronary artery disease, angina, heart failure, and revascularization. Patients with hypoxemia on exercise only were more likely to report a history of anemia. However, after Bonferroni adjustment for multiple comparisons, only a self-reported history of diabetes remained significant. Symptom scores, as assessed by the mMRC, the St George’s Respiratory Questionnaire (SGRQ), the Short Form-36 (SF-36) physical and mental components, and the Hospital Anxiety and Depression Scale (HADS) scores were similarly impaired in all 3 groups (Table 2). However, the Quality of Well-Being average daily score was significantly more impaired in the hypoxemia at rest only group. Patients were included in the LOTT if they met one of the following criteria: moderate hypoxemia at rest only, moderate hypoxemia at rest and on exercise, or moderate hypoxemia on exercise only. This patient cohort differs from others in the literature as it included patients with medical comorbidities and patients with hypoxemia at rest or with ambulation, providing a patient cohort more representative of COPD patients encountered by the practicing physician. Analysis of pre-randomization data of the 738 patients recruited for LOTT revealed significant differences between patients with the 3 patterns of oxygen desaturation. Patients with hypoxemia at rest only were more likely to be current smokers, have a higher BMI, and have a comorbid diagnosis of diabetes than patients in the exercise and resting hypoxemia group and the exercise hypoxemia only group. Cumulative tobacco exposure based on pack years was similar between groups. ESS and PSQI scores also revealed a trend toward an increase in daytime hypersomnolence. Conversely, patients with hypoxemia on exercise only had more severe obstruction. There is no firm consensus on the relationship between BMI and smoking, although several trials have linked increased BMI and current heavy smoking.5-9 These findings corroborate a relationship between increased BMI and current smoking. The mechanism of hypoxemia in COPD is primarily related to the mismatch of ventilation and perfusion due to airflow obstruction and emphysema.10 This mechanism is exacerbated during sleep and exercise and causes tissue hypoxemia, which exacerbates or contributes to greater symptom burden. The population of patients included in LOTT differs from the population of patients with mild to moderate hypoxemia previously described. 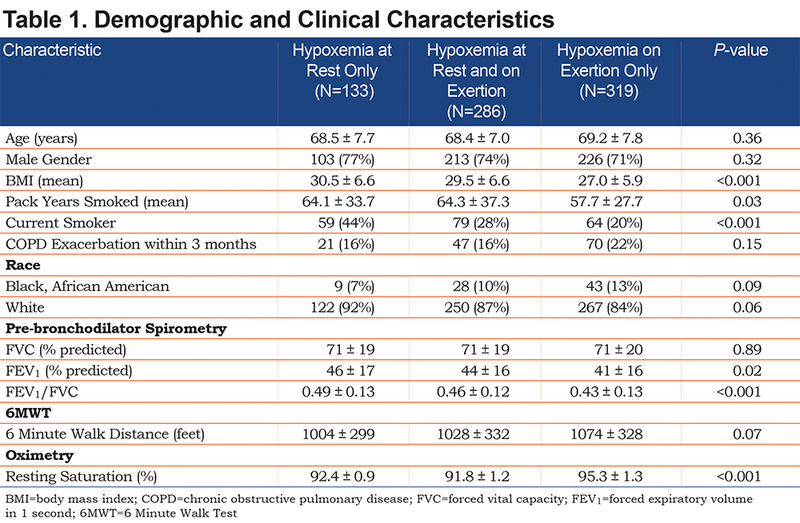 Table 4 compares baseline characteristics between the resting hypoxemia only group in the LOTT population and patients from 3 previously published cohorts of patients with mild to moderate hypoxemia at rest.14-16 The LOTT subgroup had a higher mean BMI and a lower mean degree of airway obstruction, but on average, had a similar degree of resting hypoxemia. In the LOTT group, the likelihood of hypoventilation as a result of BMI and an increased incidence of cardiovascular disease is greater and may be a significant factor in the development of hypoxemia compared to patient populations with lower BMI but more obstruction where ventilation / perfusion mismatch may be the predominant cause of hypoxemia. Our findings show that patients with hypoxemia at rest only have increased BMI, which may contribute to resting hypoxemia via the mechanisms described above, when compared to patients with exercise hypoxemia with or without resting hypoxemia. Patients with cardiovascular disease (especially congestive heart failure with reduced ejection fraction and pulmonary hypertension) are likely to be less able to compensate for gas exchange abnormalities caused by coexisting COPD. This study differs from previous cohorts in that these patients were not excluded, thus providing relevant information for patients treated in general clinical practice. This group, having less severe obstruction than the other groups, is equally impaired due to the mechanisms discussed above. COPD patients with hypoxemia on exercise only have been shown in prior studies to have increasing respiratory limitation during exercise testing with increasing obstruction.20 Worsened hypoxemia on exercise has been correlated with increased emphysema.21 Our findings did not assess the degree of emphysema, but did corroborate the correlation between exercise-induced hypoxemia and increased airway obstruction. A limitation of this study is that it does not include more comprehensive physiologic data (e.g., lung volumes, arterial blood gases and diffusion capacity) to provide more information on the differences between these groups. Self-reported cardiac comorbidities, while a trend was present between groups, are less informative than more objective data. These data would provide direct evidence of cardiac function, which is unknown in these groups. Additional data could also elucidate the prevalence and severity of pulmonary hypertension and cor pulmonale in these groups. Similarly, although the degree of expiratory airflow obstruction was different between groups, the degree of emphysema, as measured by computed tomography, lung volumes, and diffusion capacity, is not known. Further research should address these questions. Increased indices of sleep-disordered breathing as measured by questionnaires had a trend towards association with hypoxemia at rest only in this study. However, polysomnography was not available for this analysis. Therefore, the true prevalence of untreated obstructive sleep apnea is unknown. Patients with obstructive sleep apnea are likely to have increased oxygen needs during sleep, which were not assessed by the study and could be clinically important.22 The prevalence of Obesity Hypoventilation Syndrome , which also would be an important contributor to gas exchange abnormalities, is not known in this cohort. Measurement of oxygen saturations at rest and with exertion is required to distinguish these groups; further studies including pulmonary function tests and chest imaging will be required to better determine distinguishing clinical characteristics between them. Patients with COPD enrolled in LOTT with hypoxemia at rest only were more likely to be current smokers and had more comorbid diagnoses of obesity and diabetes than patients with hypoxemia on exercise only. Patients with hypoxemia on exercise only had more severe obstruction than patients with hypoxemia at rest only. General and disease-specific quality of life scores including the HADS, SGRQ, and the SF-36 were impaired but similar between groups, except that quality of well-being scores were more impaired in the hypoxemia at rest only group. Differences in clinical, demographic, and physiologic parameters exist between COPD patients with different patterns of hypoxemia. Brigham and Women's Hospital: Anne L. Fuhlbrigge, MD; Ernestina Sampong. Associated sites: Boston Medical Center: Karin Sloan, MD; Ashley Wagner; Susan Anderson. Boston VA: Marilyn Moy, MD; Osarenoma Okunbor. Cleveland Clinic Foundation: James K. Stoller, MD, MS (principal investigator); Scott Marlow, RRT; Yvonne Meli, RN; Richard Rice, RRT, MEd (study coordinators); Loutfi S. Aboussouan, MD; Robert Castele, MD; Joseph Parambil, MD; Sumita Khatri, MD; Aman Pande, MD; Joe Zein, MD; Thomas Olbrych, MD (co-investigators). Associated sites: Crouse Medical Practice: Stephan Alkins, MD; Christine Jocko, MA. Cleveland Clinic Florida: Franck Rahaghi, MD, MH; Jean Barton, MBA. Denver Health and Hospital Authority: Richard K. Albert, MD; Jennifer Underwood. Associated sites: National Jewish Health:Barry Make, MD, FACP, FCCP; Jennifer Underwood. Duke University: Neil MacIntyre, MD; John Davies. Kaiser Foundation Hospitals: Thomas Stibolt, MD; Richard Mularski, MD; Allison Naleway, PhD; Sarah Vertrees. Los Angeles Biomedical Research Institute at Harbor - UCLA Medical Center: Richard Casaburi, PhD, MD; Janos Porszasz, MD, PhD; Peggy Walker, RRT; Renee Indelicato. Associated sites: Loma Linda VA: Lennard Specht, MD; Kathleen Ellstrom, PhD, RN; Jamie Portillo, RRT. City of Hope National Medical Center: David Horak, MD; Brian Tiep, MD; Mary Barnett, RN. Ohio State University: Philip Diaz, MD; Janice Drake; Mahasti Rittinger; Rachael Compton; Scott Miller. Associated site: University of Cincinnati: Ralph J. Panos, MD; Laura A. Lach, BHS. Temple University: Gerard Criner, MD; Carla Grabianowski, BSN, RN, CCRP; Francis Cordova, MD; Parag Desai, MD; Samuel Krachman, DO; James Mamary, MD; Nathaniel Marchetti, MD; Aditi Satti, MD; Eileen Mumm, CRNP; Michelle Vega-Olivo, CRNP; Jenny Hua; Vanna Tauch; Lii-Yoong Criner, RN, CCRC; Michael Jacobs, PharmD; Peter Rising, MS.
Associated sites: Geisinger Institute: Paul Simonelli, MD; Michele Mitchell, BSN, RN, CCRC. Louisiana State University: Matthew Lammi, MD; Connie Romaine, MSN, APRN-NP-C. Institute for Respiratory and Sleep Medicine: Howard Lee, MD; Mary Ianacone, DO; University of Maryland: Steven Scharf, MD, PhD; Wanda Bell-Farrell. Buffalo VA: M. Jeffery Mador, MD; Ayesha Rahman, MS. Respiratory Specialists: Mumtaz Zaman, MD; Lisa Hill LPN, CRC; Alec Platt, MD. University of Alabama: J. Allen Cooper, Jr., MD; Kathleen Harrington, PhD, MPH; Mark Dransfield, MD; Patti Smith, RN; Donald Davis. Associated sites:Birmingham VA: J. Allen Cooper, Jr., MD; Patti Smith, RN. North Florida/South Georgia VA: Peruvemba Sriram, MD; Katherine Herring. University of Michigan: Steven Gay, MD; Fernando Martinez, MD, MS; Meilan Han, MD; Kelly Rysso; Catherine Meldrum, PhD, RN, MS, CCRC. Associated sites: Beaumont Hospital: K. P. Ravikrishnan, MD; Daniel Keena, MD; Jennifer DeRidder, RN; Beth Kring, CNM, CCRC. San Antonio VA: Antonio Anzueto, MD; Alex Aguilera; Timothy Houlihan, RN. Spectrum Health: Reda Girgis, MD; Jennifer Cannestra, RN, BSN. University of Pittsburgh: Frank Sciurba, MD; Benjamin Kelly. University of Utah: Richard Kanner, MD; Mary Beth Scholand, MD; G. Martin Villegas; Judy Carle. University of Washington: David H. Au, MD, MS; Edmunds Udris, MPH. Associated sites: Harborview Medical Center: Randall Curtis, MD, MPH. VA Puget Sound HCS: David Au, MD, MS; Laura C. Feemster, MD, MS; Richard Goodman, MD; Brianna Moss, BS; Lynn Reinke, PhD, ARNP; Edmunds Udris, MPH. University of Washington Medical Center: Moira Aitken, MD; Bruce Culver, MD. Washington University: Roger D. Yusen, MD, MPH; Mario Castro, MD, MPH; Brigitte Mittler, BA; Jeanne Heaghney, RN. Associated sites: Pulmonary Consultants/Christian Hospital: Myron Jacobs, MD. University of Illinois at Chicago: Min Joo, MD, MPH; Nina Bracken, APN. Suburban Lung Associates: Edward Diamond, MD; Mary K. Joseph, PhD. University of California, San Diego: Xavier Soler, MD, PhD; Arianna Villa, BS, RRT. Central Florida Pulmonary Group: Daniel Layish, MD. Biospecimen Repository, Channing Division of Network Medicine, Brigham and Women’s Hospital: Edwin Silverman, MD, PhD; Roxanne Kelly, BS, MBA; Daniel Cossette, BS. Data Coordinating Center, Johns Hopkins University: James Tonascia, PhD; Patricia Belt; Amanda Blackford, ScM; Betty Collison; John Dodge; Michele Donithan, MHS; Cathleen Ewing; Rosetta Jackson; K. Patrick May, MS; Jill Meinert; Steven Piantadosi, MD, PhD; Girlie Reyes, BS; David Shade, JD; Michael Smith, BS; Alice L. Sternberg, ScM; Mark Van Natta, MHS; Laura Wilson, ScM; Annette Wagoner; Robert Wise, MD; Katherine P. Yates, ScM. Centers for Medicare and Medicaid Services: Rosemarie Hakim, PhD. National Heart, Lung, and Blood Institute: Antonello Punturieri, MD, PhD; Julie Bamdad, MSE; Thomas Croxton, PhD, MD; Joanne Deshler; Pamela McCord-Reynolds; Mario Stylianou, PhD; Gail Weinmann, MD (DSMB executive secretary). Data and Safety Monitoring Board: Gordon Bernard, MD (chair; Vanderbilt University); James Anderson, PhD (2007-2015; Frontier Science); Bernard Lo, MD (2007-2013; University of California, San Francisco); Andrew Ries, MD, MPH (2007-2014; University of California, San Diego); Stuart Stoloff, MD (University of Nevada); Byron Thomashow, MD (Columbia University); Barbara Tilley, PhD (University of Texas); Kevin Weiss, MD (Accreditation Council of Graduate Medical Education). None of the authors have real or apparent conflicts of interest including financial and consulting relationships to declare. 4. R Core Team. R: A language and environment for statistical computing. R Foundation for Statistical Computing:Vienna, Austria. 2016. 10. Kent BD, Mitchell PD, McNicholas WT. Hypoxemia in patients with COPD: Cause, effects, and disease progression. Int J Chron Obstruct Pulmon Dis. 2011;6:199-208. 18. Harik-Khan RI, Wise RA, Fleg JL. The effect of gender on the relationship between body fat distribution and lung function. J Clin Epidemiol. 2001;54(4);399-406. 20. Minh VD, Lee HM, Dolan GF, Light RW, Bell J, Vasquez P. Hypoxemia during exercise in patients with chronic obstructive pulmonary disease. Am Rev Respir Dis. 1979;120(4):787-794. 21. Barbera JA, Roca J, Ramirez J, Wagner PD, Ussetti P, Rodriguez-Roisin R. Gas exchange during exercise in mild chronic obstructive pulmonary disease. correlation with lung structure. Am Rev Respir Dis. 1991;144(3 Pt 1):520-525.